'Minecraft' is miswritten in the Edit Profile dialog. 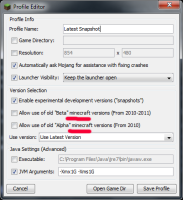 In the Edit Profile dialog, there is an option Allow use of old "Beta" minecraft versions (From 2010-2011). Whatever happened to the capital 'M'? The 'Alpha' option has this error too.